The world is a cruel place and it’s exponentially crueler to people living with disadvantageous conditions unable to be controlled. As such, August Pullman (played by outstanding young child actor Jacob Tremblay most known for his breakout role in 2015’s Room) has lived a rather sheltered life. Born with severe facial deficiencies (explained as the result of an unlucky combination of bad genetics from his parents played by Julia Roberts and Owen Wilson, also described as a disease that could have easily went to his four years older sister Via), Auggie, as he is nicknamed by his family, is an introverted child fascinated by astronomy and sci-fi entertainment such as Star Wars undergoing homeschooling conducted by his mother Isabel. The Pullman’s are feeling ready to slowly ease Auggie into society by enrolling him into school for the first time, starting off in the fifth grade, which is naturally met with mildly conflicting thoughts from each parental figure. Nate (Owen Wilson, the more laid-back and jokester of the pair) is unsure about the idea but agrees to it on the account that Auggie is brave enough to take the leap of faith. Well, brave enough to go but not without bringing his favorite toy astronaut helmet to cover his scarred and deformed face, to which Nate gently removes before entering the doors. It’s obviously not a spoiler to say things don’t start off full of rainbows and sunshine; Auggie is directly labeled as resembling Darth Sidious from Star Wars upon professing his love for the franchise during a quick classroom activity where each student tells the rest of the room two interesting things about themselves. However, what is completely surprising is that Wonder doesn’t just namedrop various established intellectual properties, Lionsgate somehow was granted access to insert different characters into many of Auggie’s imagination sequences. There’s a charming, winning monologue where the unique boy pretends what it would be like if Chewbacca, who also doesn’t look normal, attended the school, and it’s creativity like this that fills the film (and most likely the novel of the same name by R.J. Palacio) with enchantment. Surely, it also assists the already impressive performance from Jacob Tremblay as anyone that followed his road to the Oscars in 2015 knows, he loves his Star Wars. Elaborating on that, Jacob Tremblay and his director Stephen Chbosky (known for handling themes of ostracism in The Perks of Being a Wallflower) are fully aware of Auggie’s strengths and vulnerabilities. Science is unquestionably the boy’s calling and passion, but anyone simply laying eyes on him brings out anxiety and pressure, which is only made worse when other children routinely leave nasty drawings comparing him to Freddy Krueger in his locker or say heinous things like “I would kill myself if I looked like him”. Of course, they are children so for as harsh as it is, it’s also forgivable to a degree, but it and the facial disfiguration, in general, has attracted Auggie to Halloween, the one night where it’s acceptable to either cover your face or let the ugly out without judgment. The filmmakers play up how all Auggie needs is to be accepted, and once he is, out comes a talkative, humorous, carefree, beautiful soul who not only feels as if he is on top of the world, but can inject those qualities into those around him. 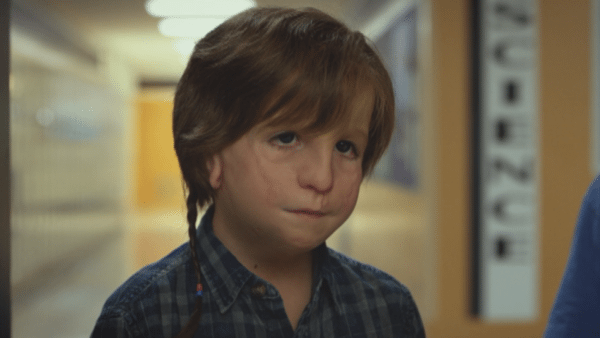 Wonder also makes it a point to show how Auggie directly affects the lives of those around him, whether it be his parents, sister, or the open-minded friends he makes. Frustratingly, some of these characters are given their own entire chapter of the film, which is a concept that probably worked much better in the novel format where there is infinite time to tell a story. 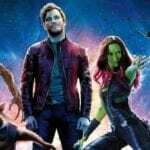 Essentially, they boil down to overly long voiceover narrations putting a spin on what we think we know (children, for the most part, will find this twisty, as adults will have no problem predicting each plot beat), and while it’s great that the filmmakers have a desire to turn these characters into more than one-note individuals, it feels like Auggie should always receive center focus. What that said, some relationships such as the one between Auggie and his sister Via (Izabela Vidovic) are superbly written; it would be very easy to paint Via as a standard high school teenager furious with unfortunate lack of attention from her parents, but she’s understanding and mature beyond her years. In a way, the situation has forced her to grow up early, and while she does occasionally show signs of frustration, there is always restraint and a compassionate, loving sister at the forefront. 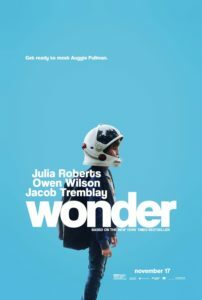 There is also an incredibly wise creative decision to limit the amount of screen time given to Owen Wilson and Julia Roberts, trusting the assembly of terrific child actors to carry the feature. Even when it’s feeling episodic, beginning and resolving a new plot point every 15 minutes, they are able to maintain interest. Most importantly, Wonder is a family-friendly movie boasting a message of acceptance that both children and adults can, and should, get behind. The fact that it handles all of this material delicately and without emotional manipulation or sentimental nonsense makes it all the better; the characters and story feel earnest. Even the makeup effects are convincing, believable, and not over-the-top. 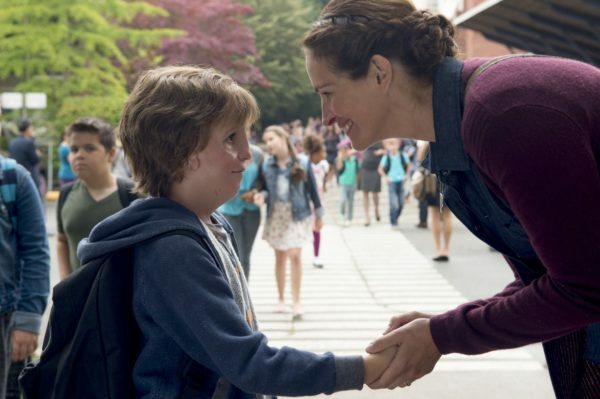 If even one child sees Wonder and chooses to stop bullying other kids or decides never to start bullying in the first place, the film has made an admirable difference.